Build your scale system on a solid, state-of-the-art foundation with the new 7400+. Whatever you weigh, a new technologically advanced PLUS+ series indicator will exceed your expectations. Off-the-shelf compatibility and clean, intuitive design make these powerful next-generation indicators easy to use… yet packed with features and technology that leaves the competition behind. Highly resistant to static-induced problems. Upload special features via the digital communication port. Proven PLUS+ Series Main Board. Indicator, no U-Bracket: 10(w) x 6-1/2(h) x 4(d)"
With U-Bracket installed, 12(w) x 7(h) x 4(d)"
Warranty The parts and components of this Pennsylvania Scale product are warranted for four years from date of retail delivery against defects in materials or workmanship, subject to the terms and conditions of our standard warranty. 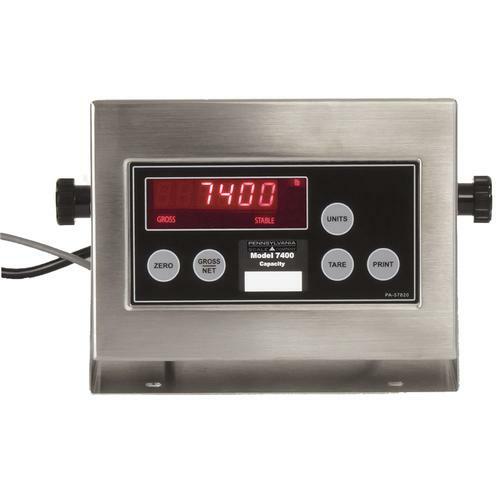 Pennsylvania Scale AC/DC Operation Rechargeable Battery for 7500 - 7600 Series - Factory Installed 30+ hours use with integrated recharging and HD power cord; functions as a U.P.S.